Grows about 18 inches high, with a spike of yellow flowers. The yellow flowers are all held close to the stem, a bit like those of Chicory. Like all Rose Family flowers, each flower has five petals. and about double that number of stamens bearing anthers with orangey-yellow pollen. And about double that number of stamens bearing anthers with orangey-yellow pollen. 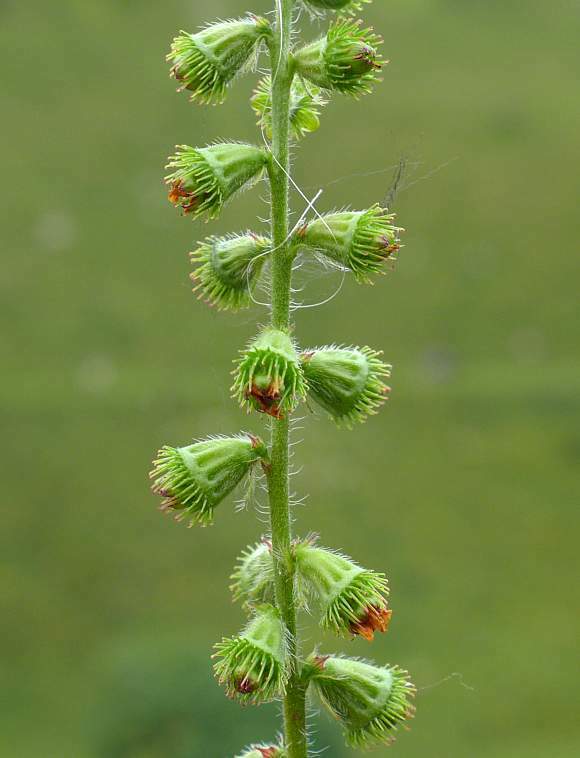 There are five green triangular-shaped sepals behind each flower, and a profusion of green barbed spikes. The flowers are a pale yellow with petals un-notched (on Fragrant Agrimonoy they are usually notched). Stamens vary considerably in number: between 5 and 20 (this specimen possessing 12). 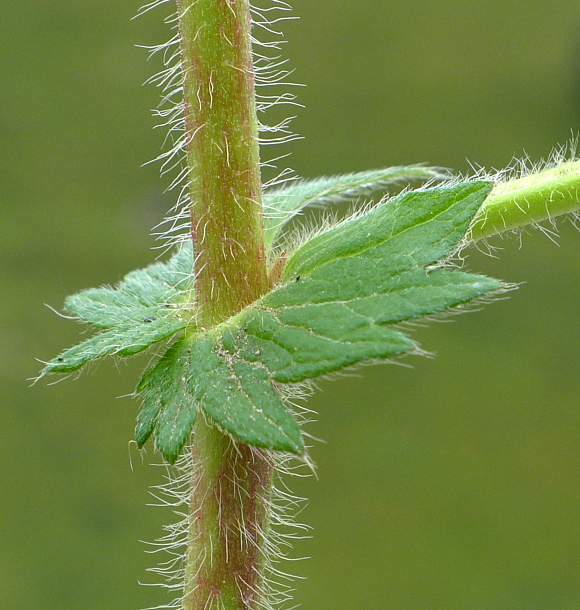 Both leaves and especially stems are hairy. The leaves with fine points at each reddened tip. The as-yet un-opened flower buds at the summit are all concentrated together in a tight cylinder. Both bract and un-opened flower buds are tipped red. 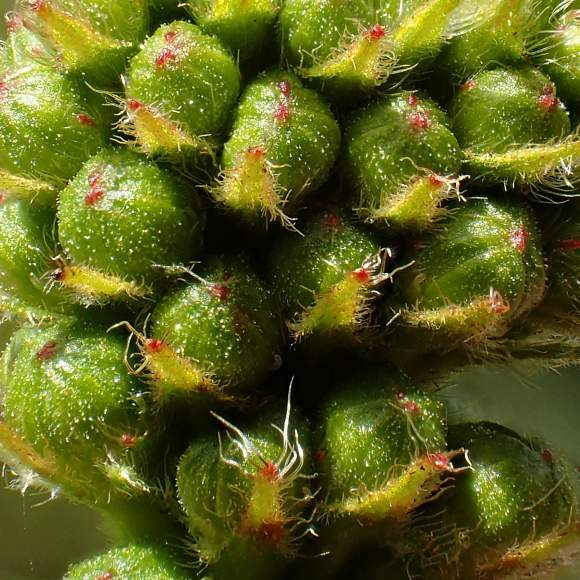 The hooked burs have red tips which are incurved. Beneath this as yet un-opened flower there is a hairy red-tipped triangular bract. 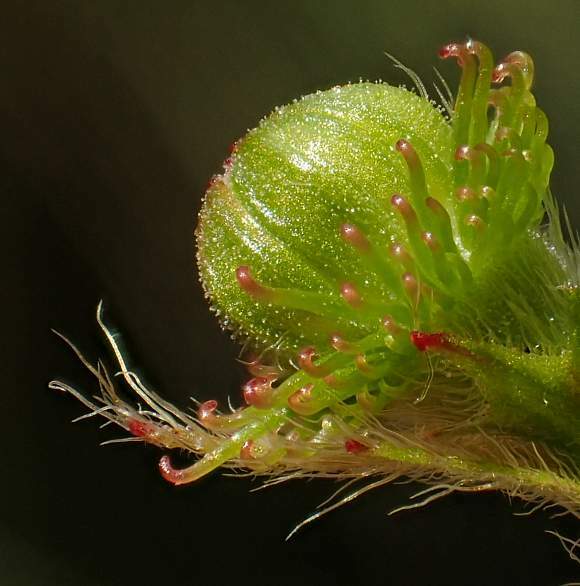 After flowering the now petal-less flower droops downwards, displaying the profusion of barbed hairs within a green conical cup. The burs attach to animals, who disperse the seeds they are attached to. The burs on the periphery are directed radially outwards (but on the very similar Fragrant Agrimony they are swept backwards). The incredible levitating Agrimony. 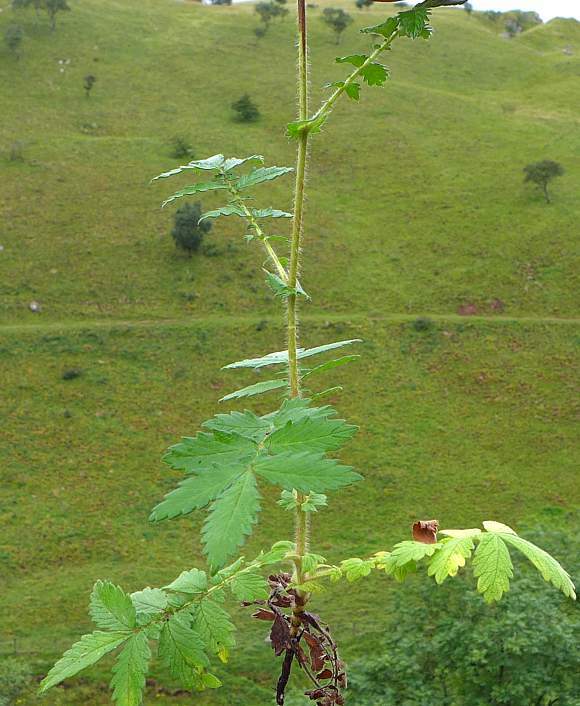 This specimen had been uprooted in the recent passed, hence the lower either dead or cloretic leaves. The leaves are typical of members of the Rose Family: pinnate with a terminal triplet. Each leaflet has deep curved teeth. A leaf in mid-stem, note that strictly - it is just one leaf, supported not by a leaf=stem but by a 'rachis'. Note the huge variation in size of the leaflets. Leaflets have more or less the same size and shape of teeth, however small some leaflets may be. Leaf and Rachis hairy. A leaf showing how two leaflets taken together wrap almost 350° around the stem where the rachis joins the main stem. Long white hairs - those of Fragrant Agrimony are much shaggier. 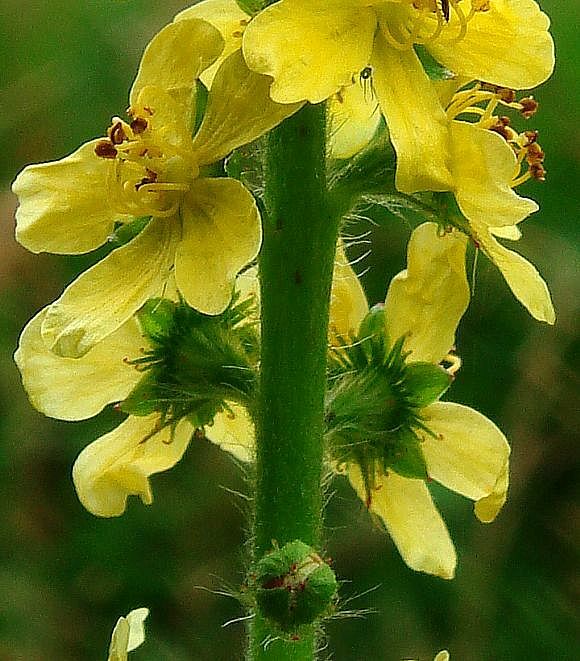 The incredible hovering Agrimony showing the lower stem leaves. Hybridizes with: Fragrant Agrimony (Agrimonia procera) to produce Agrimonia × wirtgenii , which is now extant in only one hectad square. None of the above photos are of that hybrid. 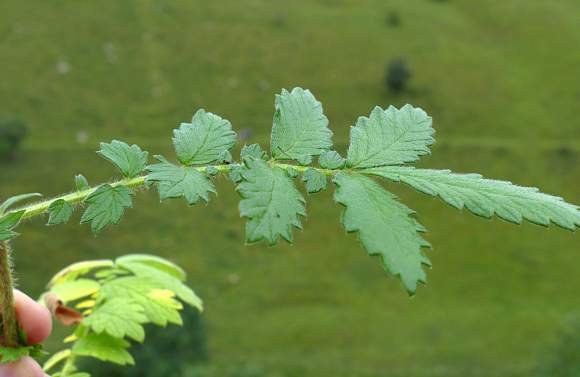 When not in flower, Meadowsweet (Filipendula ulmaria)leaves look very similar to those of Agrimony, but the latter has paler leaves and hairy stems midway up (whereas the stems of Meadowsweet are reddish and hairless). It inhabits grassy places. A yellow dye can be extracted from this plant. The honey-scented flowers were once added to mead for flavour. The dried leaves have a spicy apricot scent as do the flower spikes. Fragrant Agrimony (Agrimony procera) is more fragrant than is Agrimony and has fruit which are more bell-shaped and with no or shorter indentations around it. The pinnately arranged leaves are alternately large and small but otherwise reminiscent of those of Silverweed, another member of the Rose Family, and are silvery on the underside and have deep forward-pointing serrations. 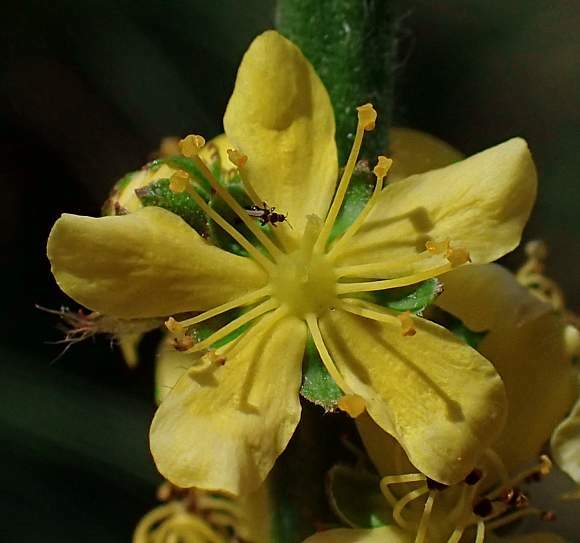 The plant has a single stiff stem with leaves around the lower half, and numerous five-petalled flowers on very short stems held close to the stem on the upper half, all facing outwards. 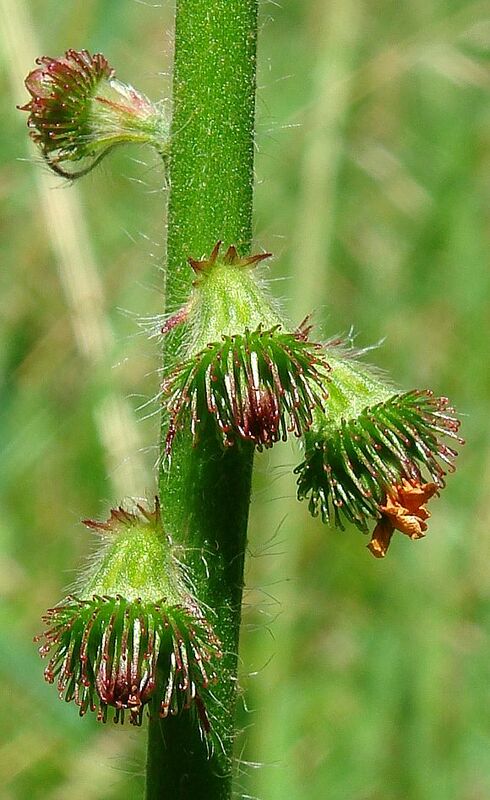 The fruits are similar to those of Wood Avens (another member of the Rose Family), and are outwardly and downward pointing. 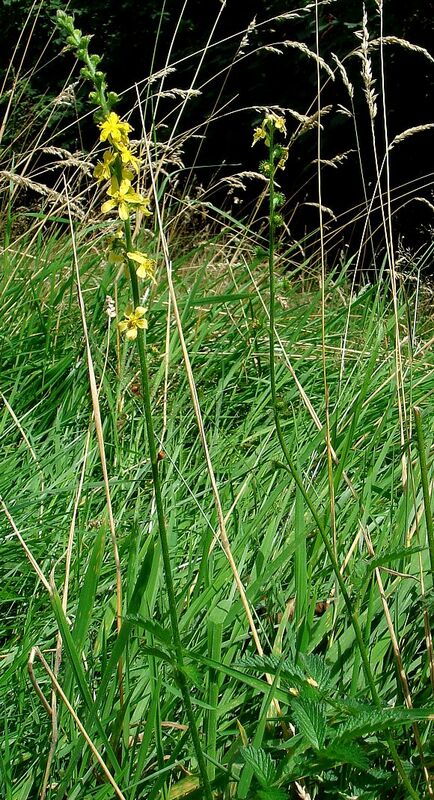 It is native and grows in grassy places in both hedgerows and fields throughout most of the UK. 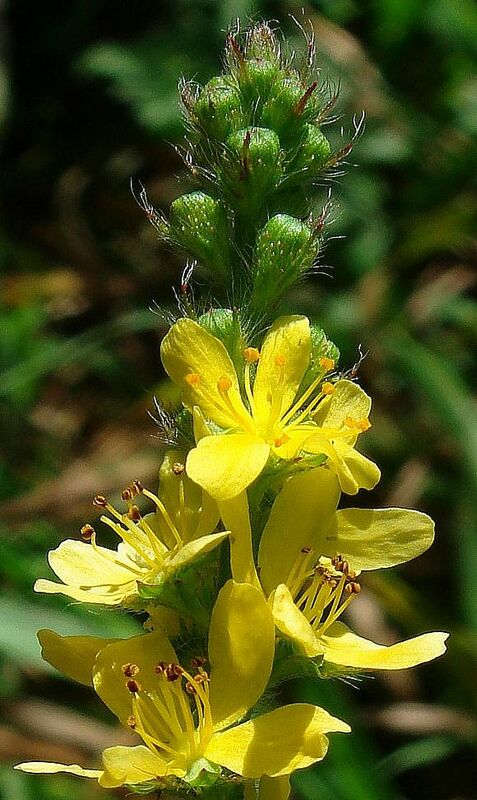 Fragrant Agrimony (Agrimonia procera) is very similar but not nearly as common although it occupies much the same habitats but avoids lime areas. It is a lot less common seeming to try to avoid being inland more than about 50 miles. It has hairs at the back of the leaves which when crushed smell very fragrant and the outermost hooked bristles of the fruit are reflexed backwards (rather than forwards of Agrimony). The petals are usually notched. There are also differences in leaves and the fruits are a wider more bulbous shape. 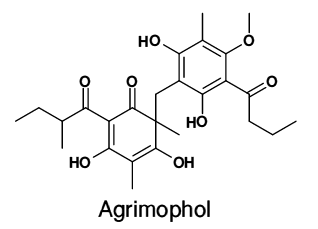 Agrimophol occurs in Agrimony and is used pharmaceutically as an anthelmintic to treat internal worms and is obtained from Agrimony for this purpose. It causes worms to lose their grip on the lining of the intestine or bladder and to be excreted. Agrimophol is an anthelmintic active against the parasite that causes River Blindness and many common bacteria such as E. coli, Staphylococcus and against other bacteria responsible for dysentry and Typhoid Fever. 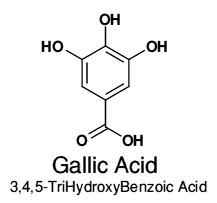 Note that Agrimophol is a near-dimer (of Gallic Acid which is described below). Ellagitannins (a class of secondary metabolites) are a type of polyphenols characterised by biaryl-linked Galloyl groups (from Gallic Acid ) which are esterified to a glucose core. They are found in tea and the wood of trees, especially hardwoods, and are toxic to micro-organisms, helping to preserve the wood. Ellagitannins are brownish. There are literally hundreds of differing ellagitannins, for the galloyl groups can combine in many different ways with the glucose units and with each other, so many that your author cannot possibly show even a fraction of them. Both Ellagitannins and Gallotanins exhibit potent anti-oxidant anti-microbial and anti-phlogistic properties. 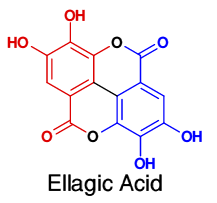 Ellagic Acid is a condensation dimer of Gallic Acid. The two Gallic Acid groups have been coloured differently, for easy identification, in red and blue. Elements of the dimer that are common to both are shown in black. Plants produce Ellagic Acid before converting it to ellagitannins. The highest levels of Ellagic Acid are to be found in the fruits of Strawberry , Cranberry, Raspberry and Grape . It too possesses anti-oxidant properties. It also inhibits the binding of certain carcinogens such as Nitrosamines and Polycyclic aromatic hydrocarbons (PAHs) to DNA, but trials of its use in treating prostate cancer have so far proved negative, but this has not stopped certain dietary supplement manufacturers from making illegal exaggerated claims of supposed benefits. Potentillin is a monomeric ellagitannin and has an α-glycosyl linkage. 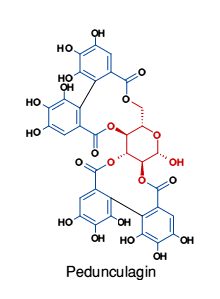 It consists of a glucose molecule (shown in red). Surrounding the glucose unit are four more Gallic Acid moieties (galloyl groups, shown in blue, apart from the hydroxyl groups). The galloyl groups are also linked together in pairs, apart from a lone one on the right. 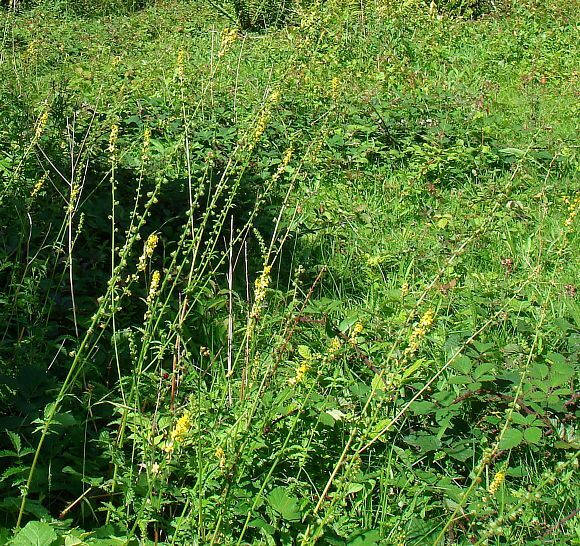 Potentillin has been found in Japanese Agrimony (Agrimonia japonica) and in Strawberry . It is interesting to note that Pedunculagin , another monomeric ellagitannin with one less galloyl group than Potentillin, is also found in many members of the same plant family. Pedunculagin exhibits anti-bacterial activity against Helicobacter pylori. It can be seen that Agrimoniin is another ellagitannin and is a dimer of two Potentillin molecules. 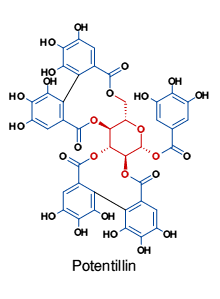 Agrimoniin consisting of two identical Potentillin molecules fused together by an oxygen bridge (central red 'O'). Your author has had to bend the molecule slightly in order to more clearly show the near bi-lateral symmetry (the way that oxygen bridge links the two identical units is the only part that is asymmetrical). 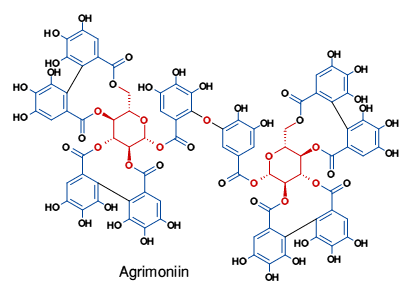 Agrimoniin is the very first dimeric ellagitannin to be discovered. 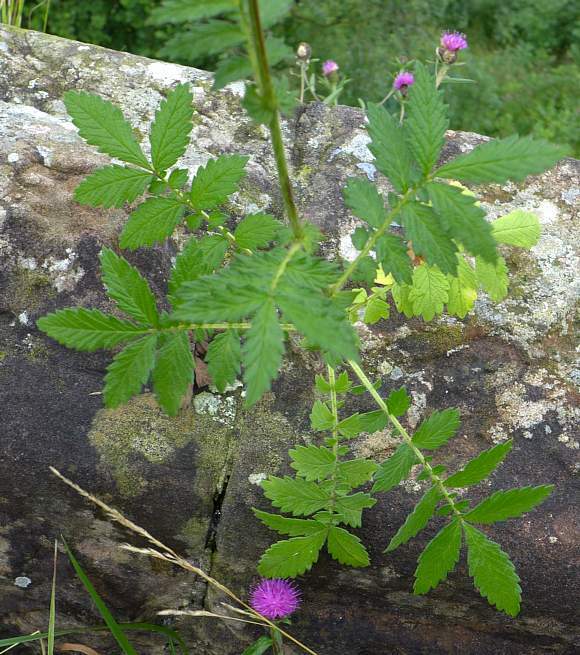 Agrimoniin was found in Agrimony, but is now known to also be present in Strawberry , and some other members of the Rose Family, especially those belonging to the Genera Agrimonia, Potentilla and Fragaria. It has anti-tumour properties amongst a host of other beneficial attributes. The flavonoids Apigenin, Luteolin, its glycoside Luteolin-7-glycoside , Quercitrin, Kaempferol and the flavonol glycoside Tiliroside . The Fatty Acids Palmitic Acid and Stearic Acid. Other acids Salicylic Acid and Silicic Acid . Vitamins Vitamin C, Vitamin K, Nicotinamide. 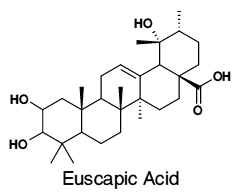 TriTerpene Glycosides: Euscapic Acid and Tormentic Acid . 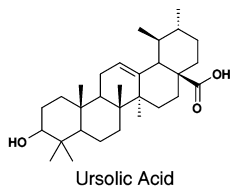 Plus the Triterpenoids α-Amyrin, Ursolic Acid, Euscapic Acid and Tormentic Acid , plus some of their glycosides.